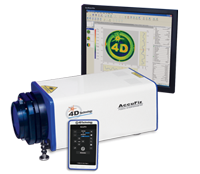 4D Technology Corporation, manufacturer of optical metrology systems, has introduced its newly improved AccuFiz compact laser interferometer for accurate, repeatable measurement of surface shape and transmitted wavefront quality. The AccuFiz Fizeau interferometer offers unmatched performance in production environments as well as in metrology labs, with industry-leading high frequency response and precision, and a 40% improvement in repeatability. New features include long-range wireless remote control, motorized tip-tilt and a variable sensitivity alignment system. The wireless remote provides control over instrument set-up, data acquisition and the motorized tip-tilt, for precise system adjustment without disturbing the cavity. The improved alignment system makes it easy to align weakly reflecting samples and high-loss cavities, even in high ambient lighting conditions. The new Surface Isolation Source option adds a second, external laser source to measure plane parallel optical surfaces, without the need for messy coatings or back-surface treatments to eliminate unwanted reflections. The external source can be used to measure the front and back surfaces, optical thickness, wedge and homogeneity of optical components. An operator can then switch easily to the internal source to measure a wide range of focal and afocal optics. The AccuFiz is designed to excel in challenging conditions. The industry’s only continuously adjustable extended source can be used to optimize for test conditions and reduce artifacts from dust, defects and stray reflections, resulting in extremely low measurement noise. On the shop floor or in a clean room, optional Dynamic Interferometry® enables short exposure times to measure despite vibration, without isolation control. The AccuFiz is extremely easy to use in confined lab spaces. Its compact, lightweight design is extremely rigid for maximum stability in any orientation or environment. The full AccuFiz product line offers wavelengths from 355 nanometers through 10.6 microns, apertures from 33 to 800 mm, and horizontal and vertical mounting configurations, providing the right options for a wide range of applications and budgets.